Ben Watson headed a stoppage time winner as Wigan lifted the FA Cup for the first time. Roberto Martinez was able to call upon Antolin Alcaraz in the centre of his three-man defence, and he used James McArthur as a right-wing-back and Jordi Gomez in central midfield. Roberto Mancini picked Joe Hart despite having used Costel Pantilimon as his FA Cup goalkeeper throughout the competition. James Milner was only on the bench, as Mancini went with two ‘interiors’ and two forwards. The nature of the result might suggest a ’smash and grab’ – but Martinez’s tactics outfoxed Mancini, and Wigan fully deserved their victory. Throughout this campaign, Martinez has been the only Premier League manager to pick a back three on a regular basis. The switch to this system towards the end of last season was a crucial factor in their impressive run to survival, and although it’s been less successful this season, it still offers a different challenge for opponents – and can make predicting results difficult, even if you have free bets to use. However, in recent weeks Martinez has suffered from severe injuries at the back – which forced him to field a back four instead, albeit with a very deep-lying midfielder protecting the centre-backs (in Tuesday night’s defeat to Swansea, it was Ben Watson), almost as a forward-playing sweeper. Therefore, with Alcaraz a real doubt and Gary Caldwell – who hasn’t trained properly for months because of a hip injury, and lacks mobility – not risked, Mancini probably expected a back four (which, for example, was how Wigan were displayed on pre-match television graphics). Instead, Wigan played a back three. This was crucial to their gameplan, and meant they always had a numerical advantage against Carlos Tevez and Sergio Aguero. Clearly, playing a back three isn’t a total solution to stopping two opposition strikers, but City were rather naive in how they played upfront – with both centre-forwards quite high up the pitch, they played into Wigan’s hands. The way to cause a back three problems is to stretch them laterally, or to leave only one player upfront, using the other to cause an overload in another part of the pitch. Martinez would have been delighted to see the lack of movement from City’s strike duo, who often rotated positions. If we can forgive Mancini’s miscalculation on that front, his decision not to start James Milner was less forgiveable. Milner, while not as naturally talented as other City attackers, is often a key part of City’s best performances – his positioning and running is highly valuable, and he links excellently with David Silva, City’s chief creator. Importantly, he also stretches the play – so when City are narrow and creative on the left, he provides some balance on the right. Most importantly, however, Milner provides defensive support. He’s famed for his work rate, and against Wigan’s strong left flank, it was amazing that Mancini didn’t select him. Regardless of the formation, Wigan are always highly dangerous down that side – 42% of their passes go down the left (when breaking the pitch into three vertical strips), the joint-most in the Premier League with Everton. Jean Beausejour might have been unavailable, but it was obvious in Wigan’s midweek defeat to Swansea that Roger Espinoza was a considerable attacking threat – he opened the scoring – even if he’s defensively suspect. With Silva playing narrow and not tracking back, Espinoza had the most space of any player on the pitch, playing so wide that his main problem often appeared to be keeping the ball in play, rather than about overcoming an opponent. Wigan’s danger down that flank was furthered by the interesting role played by Arouna Kone upfront. Rather than playing centrally and working the channels in turn, he peeled off and always moved to the left, behind Pablo Zabaleta, dragging Vincent Kompany out of position. He sometimes had a responsibility to track Zabaleta – which didn’t always work, as the Argentine got forward well a couple of times in the opening stages. 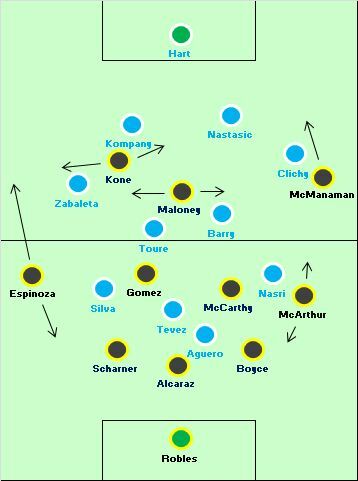 But when Kompany found himself one-against-one defending that entire side of the pitch, he looked very uncomfortable with Kone (Matija Nastasic, the other centre-back, was more concerned with Callum McManaman on the opposite side), and when Zabaleta was in a deeper position to give him support, Espinoza had freedom. Zabaleta never really seemed sure of his defensive role, and while Espinoza isn’t a particularly great player (he wouldn’t have started had Beausejour been fit), he had so much space, and was continually available for quick switches of play. On the opposite flank was the key battle of the game, McManaman against Gael Clichy. For all Martinez’s tactical skill, this was the one area of the pitch where he simply needed a player to win his individual battle. Before the game, it appeared Wigan’s best chance of a shock was a strong performance from McManaman – and he turned in a fantastic display against a much more experienced opponent. Clichy’s game is all about intercepting – steaming in ahead of an opponent to win the ball clearly. When forced to defend against a strong dribbler, the Frenchman is less assured – and the crucial part of McManaman’s game was his positioning, always putting himself in an intelligent situation to pick up possession before running at Clichy. He was given license to stay high up the pitch (not always tracking Clichy back) and moved in behind the City defend for the best two chances of the first half. With Kone left and McManaman right, Shaun Maloney was fielded as a number ten, rather than in the left-sided role he’s more accustomed to. Positioning himself between the lines, although intended as an attacking player, Maloney’s actual role was primarily defensive, in that he occupied a City midfielder. Often, Kompany would be to the right watching Kone and Nastastic would be picking up McManaman with Clichy higher up. City needed someone to watch Maloney, so Gareth Barry or Yaya Toure would sit on him. Not a great deal happened in the centre of midfield, which was bad for City, as their area of advantage was theoretically in that zone. With both Silva and Nasri coming inside, they should have been able to play clever interchanges in that zone. But there was no tempo to City’s passing, no-one in midfield who was putting their foot on the ball and dictating the game. Wigan’s good work was also a factor – their forwards stood off in open play but they kept a reasonably high line (which made it peculiar City barely used Aguero’s pace in behind) to stay extremely compact. City’s best chance fell to Tevez, and came after a rare bit of wide play. Nasri had drifted to the left in behind McArthur, which took Emmerson Boyce over to that flank and meant Wigan were disorganised in the centre. But overall, City’s play was too slow and too congested – the front four sometimes occupied a width of no more than 15 metres, playing into the hands of the Wigan back three. Mancini waited until the 55th minute to bring on Milner – he replaced Nasri, went to the right, and Silva moved to the left flank. Immediately there was more balance about City’s attacking, and Espinoza was no longer a key factor in the game because Milner tracked him back. City also created a couple of chances down the right – Milner and Zabaleta combined as the latter flashed a shot across the face of the goal, and Milner won (and took) a free-kick from the right for Jack Rodwell’s headed chance. Rodwell replaced Tevez on 69 minutes as Mancini moved to a familiar plan B – one forward off, a central midfielder on, and Toure pushed forward to become the number ten. Often it has worked, here it didn’t – Toure was extremely quiet before and after the switch, and little changed in City’s build-up play. Espinoza and McManaman had been Wigan’s joint-key players in the first half – with Espinoza nullified, McManaman carried a lot of responsibility in the second period. Thankfully for Wigan, he stepped up and motored forward on the break, constantly driving at the City backline. The biggest feature of the final half hour was City’s repeated fouls on Wigan’s right-winger. Zabaleta collected his first yellow card for a cynical, deliberate trip – Nastastic was booked for a challenge on him with 15 minutes left, an then Zabaleta was dismissed for another clear foul as McManaman sped towards goal. City were down to ten, Milner moved to right-back, and City were 4-4-1ish. With an extra man, Wigan put sustained pressure upon City. That resulted in a couple of free-kicks close to the box, and then McManaman bamboozled Clichy for the umpteenth time – there were shouts for a penalty, but Wigan won a corner. Shaun Maloney’s delivery found substitute Ben Watson (on as a straight swap for Gomez, the only change Martinez made – to head home in the 91st minute). Football matches are often decided by extremely small margins – but even if Watson’s header had sailed over and this match went into extra time (and perhaps penalties) it was clear Martinez’s tactics were highly effective. City have incredible resources, and not a single Wigan player would get into City’s starting XI – but Wigan didn’t just park the bus and ride their luck at the other end, they set up intelligently and played excellent football down the flanks. The only thing they missed for long periods was a finishing touch – McManaman failed to take two golden opportunities – and it was a substitute from a set-piece that provided the missing part of the jigsaw. Wigan’s victory was really about two things – they nullified City, and they played good football. The first part was probably more about City’s lack of tactical intelligence than Wigan’s positional brilliance – Martinez’s side are hardly renowned for their solid defence, and while the back three all performed competently, City failed to stretch them or play balls in behind. The second part was about great strategy – Espinoza’s width was crucial on the left, in a much more advanced role than the disciplined McArthur on the right. Maloney in a central role helped keep City back, while Kone’s runs caused all kind of problems for Zabaleta and Kompany. But the real star was McManaman – Martinez deserves great praise for keeping him in an advanced role, but sometimes you simply need a brilliant performance from individual. From his first half chances, to him single-handedly decimating the City backline in the second half, to him winning the corner for the winner, he was the game’s outstanding player. What a Superb system Wigan have. Please god, let them stay up. 2 Be sure to thank Napoli and Mazzarri for that, since Martinez basically borrowed this system after seeing how successful Napoli had been for several seasons with it. I would disagree, Napoli are much more of a broken team, and are much better on the break– mind you the difference in quality of the attackers is sizable. Wigan’s formation for the FA Cup is reminiscent of Napoli with Lavezzi as a wide forward (McManaman for the final), but I feel Wigan are methodical while Napoli try to be more vertical. Love teams who intelligently overcome their weaknesses, and Martinez has done so several seasons in a row. I rate Mazzari, but teams with the same formation don’t necessarily have the same style of play. Agree and disagree. Same shapes don’t mean same style or necessarily same system, but when Wigan first started using it last season, they were very much using it similar to Napoli. Martinez has tweaked it a bit to fit his players more so this season… but with their side all but relegated, you could argue it hasn’t worked. Napoli are very good on the break, which is very helpful with italian teams so good at protecting their penalty area (and partly why they struggled more against weaker teams than the stronger teams the last two seasons), but I’ve seen Napoli’s wingbacks combine for goals or atleast crosses more than Wigans. According to whoscored’s stats City made 24 tackles, to Wigan’s 10 BUT Wigan completed 23 interceptions, twelve more than City. Pantilimon >Hart. It could of been as simple as this for City. Thought Wigan were magnificient. To outplay City like that was great. They must be a frustrating side for theor supporters though! the defense can be vulnerable and they don’t necessarily turn their superioirity into goals. A season spent watching you boys lose unseservedly 1:0 must be harrowing. City, well wah can you say? Mancini’s only tactically intelligent move was to put Milner on the right, but the sending-off put an end to that. Milner had to drop deap to compensate. I grew up in Wigan, like most football fans in Wigan at the time I supported someone else (Liverpool). I think I was thirteen before I met a Wigan Athletic supporter. Shows you how far the club has risen since 1978 and unlike wimbledon (who also rose through the ranks having started the 70s outside the league) wigan have not relied on violence, anti-football or Charles hughes style “direct play” to do it. Not quite no, but they have relied on sizable investment from an outside source. There is nothing at all wrong with that and I salute the fact that DW has not been ridiculous with his money and decided to run Wigan sustainably. Different era of course, but I don’t think Wimbledon had any comparable investment. No but they did rely on violence, anti-footabll and direct play. It was a great match, and great stuff Micheal again! But, it is interesting you didn’t notice Mancini’s intention with Tevez – Rodwell sub. Rather than pushing Yaya’s physical presence higher up, he actually switched formation to 3-5-2 with Milner and Clichy on wing backs and that spread City’s back three (Nastasic, Kompany & Zabaleta) in possesion. It helped Wigan’s front three and they were real treat on breaks. One of them led to Zabaleta’s expulsion. And immediately after red card, when City switched to 4-4-1, Martinez bravely switched to 4-man defence and used one man more higher up to put City under pressure. And just after goal, he changed again to 5-4-1 to save the lead. I think Martinez is a great manager already, he has courage and great sense for tactical battles and I think he deserves bigger club than Wigan. Maybe even Manchester City, who knows. Totally agree with your observation. “Plan B” for City this season has been to take off a striker (almost always Tevez) and switch to 3-5-2. Then City grab a goal and bring on a defender type (Lescott/Nasty or Garcia) to go 5 at the back. As neat as Mancini coaches up his defense, his attacking philosophy is essentially a game of numbers. He feels the need to throw on players only to see them bottleneck around the 18 and build the opposition’s wall higher. Though I do not think the 3-5-2 has been a total failure for City this season as it’s offensive deployment has won them a number of points, it should be said that the weaknesses on the break and at the corners of the 18 have lead directly to major European losses to Dortmund and Madrid and now this. Whatever the reason, dropping milner back was dumb given the need to contain Wigan’s left wingback. Mancini primpary tactical problem is essentially Italian in origins. He is the product of a football culture that favours narrow formations. It results in a “bottleneck around the 18″ against a side like Wigan. It played right into Wigan’s hands because 3-4-3 ensured they had plenty of players through the middle to congest the zones Mancini was looking to exploit. Nice write-up. Thanks. Kudos to Martinez. But can one “decimate” a four-man defence? Sounds like reasonable odds to me. Man City are a horrible side. Huge amounts of money spent on average players (Zabaleta, Milner, Barry, Nasri), no identity and no structure. Given that this is his fourth season, it’s shocking that they are still so lacking in personnel and cohesion. Really bad team-building all round. What the hell?Why do rich club fans try to sell everyone whenever they lose? Your squad is more than adequate for treble.But you can use deep lying creator in the mould of xavi-pirlo sometimes. Zabaleta was bought by Sven for something like 3.45 Million. I’m not a Man City fan. As a neutral when it comes to English football, their poor structure, lack of squad depth and lack of cohesion is pretty obvious. Congratulations to wigan for a great performance, but for me it was more about city underperforming. They were really naive in how to play wigan and didn’t seem prepared at all. They should have kept possession for longer periods, built up decent pressure and watch the wigan defense crack. Instead they seemed too keen to attack directly and narrow. Yaya and barry should have slowed the game down and let silva pick out clever balls for the likes of ageuro. How milner didn’t start is beyond me as well, for all the reasons zm stated. In the end it didn’t seem like city had a game plan, left it to individuals to win the game and underestimated wigan. Wigan were the complete opposite and played intelligent football. Hope they can stay up and sink Sunderland, who have played poor football all season. Mancini has not only won nothing his season, but he also got knocked out from cl group stage without a win, his sack is well deserved. For his tactics, his 352 was not successful, which caused their downfall at the first half od their season. There was also nothing new in his 4411 system, therefore so many opponents knew what city was going to do and beat them with ease. Mancini ’s habit of blaming his own players did not helped the situation at all. It shown that his win of premiership last season was largely due to the players who enjoyed in top form, like Aguero, Silva, Yaya Toure, Kompany, etc. When they did not do so well this season. Mancini failed to deliver and blamed these players instead, pathetic. mancini, though his tactics weren’t spectacular here, doesn’t get enough credit. he was a goalkeeper’s toenail from the lead in the first half. who can say how the game would’ve played out had tevez scored? and interestingly enough, despite all the criticism, if atletico upsets real in the copa del rey, mourinho–a manager who gave himself his own nickname, let’s not forget–will have the same “underachieving” record of trophies over the past few seasons as mancini. i guess success–and the raised expectations that come with it–can be a manager’s own worst enemy. looks like man city now have a case of chelsea-itis. anyway, credit to martinez and wigan. nice to see the underdogs get one. 2nd in the league. Last year, 29-5-5, Marwood didn’t strengthen. I believe Mancini is a limited manager, he should have been able to incorporate width better, but there’s also a double standard in the media against him and other foreign managers when things go wrong. theme. Did you make this web site yourself? Please reply back as I’m wanting to create my very own website and would love to know where you got this from or what the theme is named. Many thanks! an impressive task and our entire group might be grateful to you. learn far more from you. That is actually a tremendous website. around the net. Shame on the seek engines for no longer positioning this put up higher! I’ve read this post and if I could I wish to suggest you some interesting things or tips. Perhaps you can write next articles referring to this article. I want to read more things about it! Excellent analysis Michael. Gutted for Wigan that they’ve been relegated. They really were refreshing with their approach. Ah well, we’ll just have to put up with the likes of Stoke and West Ham for another year! 1 cell computer speaker systems, I fear I might becoming a fabulous klipsch fanboy! blog’s post to be updated daily. It carries nice information. the net. Disgrace on the search engines for no longer positioning this publish upper! I’m gone to convey my little brother, that he should also go to see this web site on regular basis to obtain updated from latest gossip. to no back up. Do you have any methods to prevent hackers? as i want enjoyment, as this this website conations really pleasant funny material too. Good article. I will be facing many of these issues as well. First of all I want to say terrific blog! I had a quick question in which I’d like to ask if you do not mind. I was curious to know how you center yourself and clear your mind prior to writing. I have had a difficult time clearing my thoughts in getting my thoughts out there. I do take pleasure in writing but it just seems like the first 10 to 15 minutes are usually wasted simply just trying to figure out how to begin. Any ideas or tips? Thanks! it very troublesome to tell the reality on the other hand I’ll certainly come back again. Hello! I’ve been following your website for a while now and finally got the courage to go ahead and give you a shout out from Atascocita Texas! Just wanted to mention keep up the good work! Let’s basically hope that sound top quality isn’t while horridly torturous because that found on Beats-branded headsets. it may not be a taboo matter but generally people do not speak about these issues. I’m hoping to present one thing back and aid others such as you aided me. You really make it seem so easy with your presentation but I find this matter to be really something which I think I would never understand. It seems too complicated and very broad for me. I am looking forward for your next post, I抣l try to get the hang of it! also outlined out the entire thing without having side effect , other people can take a signal. Many chanel store check stunning regarding others!! my hubby and i love these businesses soooo drastically, just one failure might be its own tough keep my favorite toes and fingers back into the rearfoot section, tid bit skinny. Hot sale Cheap Nike Free, Nike Free Run Sale 3.0, Cheap Nike Blazers Online store, Nike Blazers Sale. All shoes 50% OFF On Sale. FtuSsfI TrpMok [url=http://www.saclongchampsoldes2013.net]sac longchamp[/url] reasons before sewn-in [url=http://www.sacmichaelkors2013.net]michael kors collection[/url] YqwDfi DzlTau [url=http://longchampsacspliages.weebly.com]longchamp sacs[/url] state they have handbags they make use of frequently,[url=http://isabelmarantsneakersbaskets.weebly.com]Isabel Marant sneakers[/url] ensemble VuxZyc. Guess QqmZyj stylish [url=http://burberrybagssale.rhhsweb.com]cheap Burberry[/url] that catch the attention of UloNhe [url=http://longchampbagssale.rhhsweb.com]Longchamp bags[/url], QpyVej Speculate barrel [url=http://michael-kors-pas-cher.manifo.com]Michael Kors pas cher[/url], that we intended all guess fans are aware. [url=http://acheter-sac-longchamp.manifo.com]longchamp pliage[/url] osZhv SltDp accompanies [url=http://acheter-sac-guess.manifo.com]Sac ¨¤ main Guess[/url] just about anything and cqHbk HubUm. Among our favorite new cheap jordan shoes releases, the Nike Free Powerlines+ 2 returns this summer in a two-tone brown version. The almond brown nubuck and mesh upper goes really well with the yellow details on the heel and lacing, as well as the darker brown Swoosh and lining. Look out for a release in the coming months.